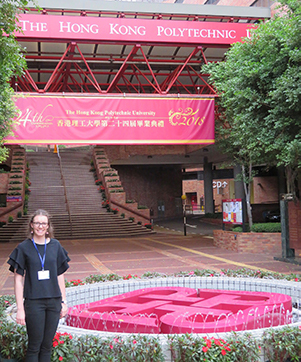 Charles Sturt University (CSU) final-year Bachelor of Physiotherapy student Ms Claire Smart (pictured) recently presented her Honours research paper at the 11th Pan-Pacific Conference on Rehabilitation in Hong Kong. Ms Smart, who completed study at CSU in Albury-Wodonga earned a first class Honours grade for her dissertation Kinesio Tape in Paediatric Physiotherapy: Exploring Practitioner Experience. Ms Smart was one of six presenters in an oral session on paediatric rehabilitation at the conference. She noted that her interest for this research came from recently collaborating with an experienced paediatric physiotherapist. “I found there was a gap in empirical evidence in this area, and that there were potentially many physiotherapists with experiences that could drive future research,” Ms Smart said. With a passion for working with people with disabilities, and in particular children, Ms Smart also had the opportunity to attend a short course by Dr Diane Damiano as part of the conference in Hong Kong. “Dr Damiano led a session about the ‘State-of-the-evidence in physiotherapy for enhancing activity and participation in children with cerebral palsy’,” Ms Smart said. “This was a very insightful and inspiring short course into what physiotherapy and technology can offer children with cerebral palsy to help them achieve their full potential. Ms Smart hopes to have her article published in 2019. She has already been offered a job working as a physiotherapist for children and people with disabilities. “I have loved studying at Charles Sturt University, but I am now looking forward to starting full-time work and opportunities for future research in the area I’ll be working in,” she said.